Seven Generations Energy Ltd. (TSX:VII) has reached an agreement that will significantly expand its ownership in the prolific and low-supply-cost Montney Nest liquids-rich natural gas play with the acquisition of about 30,000 barrels of oil equivalent (boe) of daily production, 155 net sections of Montney land and 199 million boe in proved reserves from Paramount Resources Ltd. (Paramount) for approximately $1.9 billion in total consideration consisting of cash, 7G shares and the assumption of a portion of Paramount's debt. "This asset merger of neighbouring and early-life development lands will open the door to new operational and investment synergies in our Kakwa River Project. Our drilling, completions and production innovations are delivering liquids-rich natural gas that ranks among the lowest supply cost in North America. When we assemble these lands, we will be in an even better position to anchor market expansion initiatives," said Pat Carlson, 7G's Chief Executive Officer. "This counter-cyclical acquisition is a natural consolidation of our high-growth Nest resource play, where our highest value Nest 2 acreage will increase by more than 40 percent, from 101 to 144 sections. Upon deal completion, we will have assembled more than half a million net acres of concentrated Montney lands - one of North America's most prolific resource plays," said Marty Proctor, 7G's President & Chief Operating Officer. "This transaction merges the two industry leading positions in the world-class Kakwa Montney play. We believe this transaction provides a compelling opportunity to realize premium value on our Musreau/Kakwa acreage for Paramount shareholders while retaining ongoing upside exposure to the play through our significant shareholding in Seven Generations. We have worked with, and invested in, members of Seven Generations management in the past and we believe this team will continue to bring the operational and innovative expertise that the Paramount team has brought to bear in the past to ensure the asset competes at the leading edge of North America's natural gas industry," said Jim Riddell, President and Chief Executive Officer of Paramount. "This Montney Nest consolidation will enable greater optimized development of a substantially expanded Kakwa River Project. 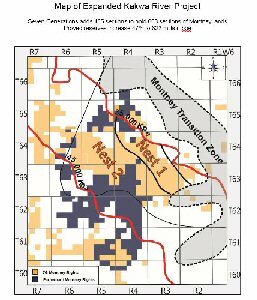 With seamless continuity of the offsetting and overlapping mineral rights across current borders, we now plan to drill longer wells in the Upper and Middle Montney Formation. In addition, we expect to add significant potential resource in shallower and deeper formations across our expanded lands," Proctor said. 7G's second quarter 2016 production is estimated at more than 115,000 boe/d, which puts 7G on track to surpass its original 2016 production guidance of 100,000 to 110,000 boe/d. Subject to the closing of the transaction, Seven Generations is revising 2016 production guidance to between 120,000 and 125,000 boe/d, and 2016 capital investment is planned at $1.05 billion to $1.1 billion, up from the original range of $900 million to $950 million. "With our continuously advancing well designs and operating practices, including many new techniques now under testing and development, we expect to further improve recoveries and capital efficiencies in this larger resource base. By employing our Super Pad development methods, we'll look to drill more and longer wells from fewer surface locations, recover more resource at a lower per-unit cost, and more efficiently unlock the tremendous potential of this Montney Nest resource," said Glen Nevokshonoff, 7G's Vice President, Development. "We have entered into this transaction with a commitment to maintaining our financial strength while adding complementary reserves and resources that we believe will add substantial value and full-cycle returns for shareholders. We expect it to be accretive within the first year of ownership on a cash flow, production and reserves per share basis. We expect the net debt to cash flow ratio to be approximately neutral at the end of 2016 and we expect to have sufficient cash and funds from operations to finance anticipated 2017 capital investments. Financial strength and prudent use of debt and equity continue to be at the core of 7G's financial strategy," said Chris Law, 7G's Chief Financial Officer. Seven Generations will fund the approximately $1.9 billion acquisition with a combination of $475 million of cash, 33.5 million 7G common shares issued from treasury to Paramount and the assumption of Paramount's US$450 million (approximately C$584 million) 6.875% notes maturing in 2023. The transaction has an effective date of June 1, 2016 and is subject to Paramount shareholder approval, approval under the Competition Act and other normal closing conditions. It is expected to close in August 2016. Concurrent with the transaction, 7G has entered into a $650 million bought deal financing whereby a syndicate of underwriters have agreed to purchase up to 26.7 million subscription receipts at a price of $24.35 per share. Proceeds from the financing will be used to fund the cash portion of the acquisition as well as provide funding for the company's ongoing capital investment program. The Board of Directors of Paramount has unanimously approved the transaction and has also resolved to recommend that Paramount shareholders vote their common shares in favour of the transaction. Clayton Riddell, Executive Chairman of Paramount, has entered into a support agreement pursuant to which he has agreed to vote his Paramount common shares, representing 37 percent of the issued and outstanding shares of Paramount, in favour of the transaction. Paramount has agreed not to solicit or initiate any discussion regarding any other transaction or business combination. Paramount has also granted 7G a right to match any acquisition proposal and has agreed to pay a termination fee of $80 million to 7G in certain events, including if Paramount recommends, approves or enters into an agreement with respect to an acquisition proposal. To view the map, please visit the following link: http://www.marketwire.com/library/20160706-7gen8001.jpg. Upon closing of the transaction, 7G will have access to newly constructed natural gas and liquids processing and pipeline capacity that provide for additional production growth. 7G will now have access to a combined 555 MMcf/d of sweet gas processing, 200 MMcf/d of sour gas processing at the Musreau Complex, owned by Pembina Pipeline Corporation. "This incremental capacity creates additional flexibility for product processing and further strengthens 7G's marketing portfolio," said Merle Spence, Senior Vice President, Marketing. "While our practice to date has been to own and operate our own processing capacity, we look forward to working with Pembina to expand 7G's market access and pursue a strategic partnership to develop some of the lowest supply cost production in North America," Carlson said. 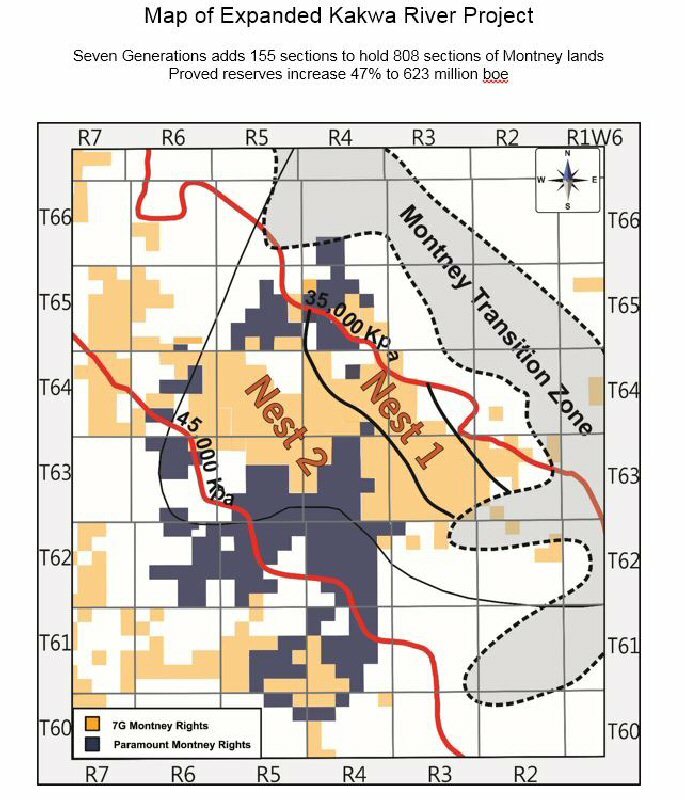 The addition of undeveloped lands between 7G's Nest 2 and Deep South West areas provides contiguous lands to optimize future development as drilling steps out from Nest 2 and gathering systems form a continuous infrastructure network. A larger Kakwa River Project is expected to deliver improved capital efficiencies in managing and contracting services and employing common infrastructure such as larger well pads, roads, pipelines, natural gas processing and water sourcing and management. 7G expects to achieve additional optimization by capitalizing on the well-honed operating experience of its Kakwa team. "Our low-cost supply is highly competitive and we have the transportation in place to significantly increase our production over the next several years, however Western Canada needs to expand markets in the long term. This acquisition will substantially add to and fortify the capacity of our large and high-quality resource, which is sufficient to underpin new, integrated market access infrastructure. Our core business is relentless pursuit of technical innovation to stay at the toe of the supply cost boot of liquids-rich natural gas production. We are continually evaluating opportunities to optimize the value of our resource and are engaged in discussions with new customers and potential developers of natural gas-fired electricity plants, liquefied natural gas export facilities, gas-to-diesel refining and petrochemicals. This complementary Montney acquisition adds significant resource scale as we look for ways to anchor major infrastructure development and build our business for many years ahead," Carlson said. Concurrent with the transaction, 7G has entered into an agreement with a syndicate of underwriters led by RBC Capital Markets, Peters & Co. Limited, and Credit Suisse Securities (Canada), Inc. under which they have agreed to purchase from 7G and sell to the public 26.7 million subscription receipts at a price of $24.35 per subscription receipt for total gross proceeds of $650 million (the offering). 7G has also granted the underwriters an over-allotment option to purchase, on the same terms as the offering, up to an additional 4,005,000 subscription receipts. This option is exercisable by the underwriters, in whole or in part, at any time for a period of 30 days following closing. Each subscription receipt represents the right of the holder to receive, upon closing of the acquisition, without payment of additional consideration or further action, one common share of 7G. The gross proceeds from the offering will be held in escrow, pending closing of the acquisition. Assuming the acquisition closes on or before October 31, 2016, the escrowed proceeds from the offering of subscription receipts will be released to 7G and used by 7G to fund the cash portion of the acquisition as well as provide funding for the company's ongoing capital investment program. If the acquisition fails to close by October 31, 2016, or the acquisition is terminated at an earlier time, the gross proceeds and pro rata entitlement to interest earned on the escrowed proceeds thereon will be paid to holders of the subscription receipts. The subscription receipts will be offered to the public in Canada by way of short form prospectus filed with the securities regulatory authorities in each of the provinces of Canada. The offering is subject to the receipt of all necessary regulatory and stock exchange approvals. The closing date of the offering is expected to be in August 2016. None of the subscription receipts not the common shares have been and will not be registered under the United States Securities Act of 1933, as amended, or any state securities laws and may not be offered or sold in the United States absent registration in the United States or the availability of an exemption from such registration. This press release shall not constitute an offer to sell or the solicitation of an offer to buy securities in any jurisdiction. Peters & Co. Limited and RBC Capital Markets are acting as financial advisors to Seven Generations in connection with the acquisition. Credit Suisse is acting as a strategic advisor. Seven Generations is a low-supply-cost, high-growth Canadian natural gas developer generating long-life value from its liquids-rich Kakwa River Project, located about 100 kilometres south of its operations headquarters in Grande Prairie, Alberta. 7G's corporate headquarters are in Calgary and its shares trade on the TSX under the symbol VII. This news release contains certain forward-looking information and statements that involves various risks, uncertainties and other factors. The use of any of the words "anticipate", "continue", "estimate", "expect", "may", "will", "should", "believe", "plans", and similar expressions are intended to identify forward-looking information or statements. In particular, but without limiting the foregoing, this news release contains forward-looking information and statements pertaining to the following: the anticipated benefits of the acquisition and the impact of the acquisition on the Kakwa River Project; the Company's anticipated drilling plans and expectations for resource recoveries and capital efficiencies; completion of the acquisition and the bought deal financing, including satisfaction of conditions relating thereto and the timing thereof; the pro forma financial, operating and reserves information of the Company after completion of the acquisition; anticipated growth; expected incremental processing capacity; 2016 capital expenditure budget, debt to cash flow ratio and anticipated production growth; production estimates; revised production guidance; the expected size, pricing and use of proceeds of the bought deal financing; the issuance of the common shares of the Company underlying the subscription receipts; the ability to fund the Company's capital requirements from cash and funds from operations; the construction of additional Super Pads; and the ability to generate long-life value from the Kakwa River Project. In addition, references to reserves are deemed to be forward-looking information as they involve the implied assessment, based on certain estimates and assumptions, that the reserves described exist in the quantities predicted or estimated. With respect to forward-looking information contained in this news release, assumptions have been made regarding, among other things: satisfaction of the conditions to closing of the acquisition and the financing; future oil, natural gas liquids and natural gas prices; the Company's ability to successfully integrate the acquired assets; the Company's ability to obtain qualified staff and equipment in a timely and cost efficient manner; the Company's ability to market production of oil, natural gas and natural gas liquids successfully to customers; the Company's future production levels; the applicability of technologies for the Company's reserves; future capital investments by the Company; future funds from operations from production; future sources of funding for the Company's capital program; the Company's future debt levels; geological and engineering estimates in respect of the Company's reserves and resources; the geography of the areas in which the Company is conducting exploration and development activities; the access, economic and physical limitations to which the Company may be subject from time to time; the impact of competition on the Company; and the Company's ability to obtain financing on acceptable terms. volatility in market prices and demand for oil, natural gas liquids and natural gas and hedging activities related thereto; general economic, business and industry conditions; variance of the Company's actual capital costs, operating costs and economic returns from those anticipated; risks related to the exploration, development and production of oil and natural gas reserves and resources; negative public perception of oil sands development, oil and natural gas development and transportation, hydraulic fracturing and fossil fuels; actions by governmental authorities, including changes in government regulation, royalties and taxation; the management of the Company's growth; the availability, cost or shortage of rigs, equipment, raw materials, supplies or qualified personnel; the absence or loss of key employees; uncertainty associated with estimates of oil, natural gas liquids and natural gas reserves and resources and the variance of such estimates from actual future production; dependence upon compressors, gathering lines, pipelines and other facilities, certain of which the Company does not control; the ability to satisfy obligations under the Company's firm commitment transportation arrangements; uncertainties related to the Company's identified drilling locations; the concentration of the Company's assets in the Kakwa area; unforeseen title defects; Aboriginal claims; failure to accurately estimate abandonment and reclamation costs; changes in the interpretation and enforcement of applicable laws and regulations; terrorist attacks or armed conflicts; natural disasters; reassessment by taxing authorities of the Company's prior transactions and filings; variations in foreign exchange rates and interest rates; third-party credit risk including risk associated with counterparties in risk management activities related to commodity prices and foreign exchange rates; sufficiency of insurance policies; potential for litigation; variation in future calculations of certain financial measures; sufficiency of internal controls; impact of expansion into new activities on risk exposure; risks related to the senior unsecured notes and other indebtedness, including: potential inability to comply with the covenants in the credit agreement related to the Company's credit facilities and/or the covenants in the indentures in respect of the Company's senior secured notes; seasonality of the Company's activities and the Canadian oil and gas industry; weather related risks, fires and natural disasters, and extensive competition in the Company's industry. This news release also contains future-oriented financial information and financial outlook information (collectively, FOFI) about the Company's prospective results of operations, debt and available funding, all of which are subject to the same assumptions, risk factors, limitations and qualifications as set forth in the above paragraphs. FOFI contained in this news release provided for the purpose of describing the anticipated effect of the acquisition on the Company's business operations and should not be used for purposes other than for which it is disclosed herein. The forward-looking information and statements and FOFI contained in this news release speak only as of the date hereof, and the Company does not assume any obligation to publicly update or revise them to reflect new events or circumstances, except as may be required pursuant to applicable laws. This news release includes certain terms or performance measures commonly used in the oil and natural gas industry that are not defined under IFRS, including "available funding" and "net debt". The data presented are intended to provide additional information and should not be considered in isolation or as a substitute for measures of performance prepared in accordance with IFRS. These non-IFRS measures should be read in conjunction with the Company's financial statements and accompanying notes. For more information regarding "available funding" and "net debt", see "Non-IFRS Financial Measures" in the Company's Management's Discussion and Analysis for the three months ended March 31, 2016. Estimates of the Company's reserves as at December 31, 2015 are based upon the report that was prepared by McDaniel & Associates Consultants Limited (McDaniel) evaluating the Company's oil, natural gas and NGL reserves, dated March 7, 2016. Estimates of the reserves attributable to the assets being acquired from Paramount (the Assets) are based upon the report date June 5, 2016 that was prepared by McDaniel evaluating the oil, natural gas and NGL reserves of the Assets effective December 31, 2016. The estimates of reserves provided in this news report are estimates only and there is no guarantee that the estimated reserves will be recovered. Both evaluations were prepared in compliance with the standards set out in the National Instrument 51-101 of the Canadian Securities Administrators and the Canadian Oil and Gas Evaluation Handbook. Actual reserves may be greater than or less than the estimates provided in this news release, and the difference may be material. There is no assurance that the forecast price and cost assumptions made by McDaniel in evaluating the reserves of the Company and the Assets will be attained and variances could be material. For important additional information regarding the independent reserves evaluation that was conducted by McDaniel, please refer to the Company's AIF, which is available on the SEDAR website at www.sedar.com. gross means in relation to the Company's interest in reserves, its "company gross reserves", which are the Company's working interest (operating or non-operating) share before deduction of royalties and without including any royalty interests of the Company. net means, in relation to the Company's interest in a property, the total area in which the Company has an interest multiplied by the working interest owned by the Company. (1) Seven Generations has adopted the standard of 6 Mcf:1 bbl when converting natural gas to boes. Condensate and other natural gas liquids are converted to boes at a ratio of 1 bbl:1 bbl. Boes may be misleading, particularly if used in isolation. A boe conversion ratio of 6 Mcf:1 bbl is based roughly on an energy equivalency conversion method primarily applicable at the burner tip and does not represent a value equivalency at the Company's sales point. Given the value ratio based on the current price of oil as compared to natural gas is significantly different from the energy equivalency of 6 Mcf: 1 bbl, utilizing a conversion ratio at 6 Mcf: 1 bbl may be misleading as an indication of value. Seven Generations Energy Ltd. is referred to herein as Seven Generations, Seven Generations Energy, 7G and the Company.